It feels like just a couple months ago I was at Disney Social Media Moms On-the-Road in 2016! I can’t believe it’s already been a whole year! For those who are wonder what is Disney Social Media Moms? It is a series of conferences across the country each year where mom bloggers (who also love Disney of course) get invited to hear Disney news, as well as a series of motivational speakers and get tips on blogging and social media. Not to mention, each year it’s a great place to meet new blogger friends. 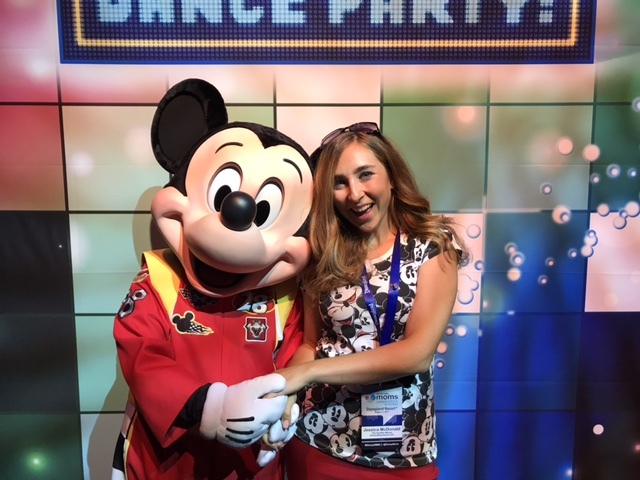 This event is always one Disney moms look forward to – it’s easy to sense the excitement in the air, especially when after the conference we get to spend a day at Disneyland with our families, experiencing all the latest attractions! We first heard from Erin Glover, who is an editor for the Disney Parks Blog. I’ve been a fan of the Disney Parks Blog since it first began, so it’s always a pleasure to hear her speak. Megan Sayers Chapman from Babble also spoke, with both of them giving us great tips on how to optimize content for each platform: Twitter, Facebook, Instagram, YouTube, etc. Although it may seem like information a blogger would already know, hearing her speak about her tips helped give me new ideas on how to fit my blog’s content for each platform, and helped give me new excitement for my blog. It’s always nice to get rejuvenated and hear a fresh perspective on what you do in your job each day. It really helps get the creative side of your brain going! Afterward, we had the pleasure of seeing clips and hearing the songs from the upcoming short feature Olaf’s Frozen Adventure, which will be playing before Coco in theaters. The songs were enchanting, and the story of Anna and Elsa trying to come up with holiday traditions for themselves is so sweet! Being a huge fan of the holiday season, I couldn’t be more excited about this short film. It was great being able to get a behind the scenes look, and hear about the passion put behind this project. The keynote speaker was Good Morning America anchor Amy Robach. She spoke about her battle with cancer, how it’s changed her, and how she has used her journey and life experiences to influence her role as a journalist, field reporter, as well as mother and stepmother. After the event, I left feeling like I gained so many great tools to help improve my content across my social media platforms. After all, social media is how I get all of my hard work seen, so these tips were priceless! Not only that, but as I spent the day walking around the park with loved ones and seeing new attractions like the Disney Junior Dance Party,i Guardians of the Galaxy Mission Breakout, and Fantasmic!, it made me reflect upon how I’m so grateful to be part of a blogger community that is so magical, imaginative, and aspiring!